Group Case Play 2013-03 (R2 Segura stealing first base) is now final. Answer appears below. To refresh: With R1 and R2, F1 sniffed out R2's stolen base attempt and trapped him in a rundown between second and third as R1 advanced to second base. With R1 standing on second, R2 slid safely into second base, ballcarrier F5 tagging both R1 and R2 while both occupied second before again tagging R2 as R2 retreated towards first base before assuming a position on first. "Time" was called and R2 became R1; R1 was (formerly R2) subsequently was thrown out trying to steal second base. Click the above pic to watch the baserunning chaos unfold. Rule 7.08(i) was the most cited rule in our group discussion. It states, in part, that a runner is out when he "runs the bases in reverse order for the purpose of confusing the defense or making a travesty of the game." However, as R2 did not appear to be motivated in this fashion (he was confused himself), Rule 7.08(i) Comment, which addresses the case of a decoyed or confused runner, references the case of a runner touching an unoccupied base and then returning to the base he last touched. The unoccupied base referred to here would have been third and the base he last touched would be second, not first. Accordingly, 7.08(i) does not directly apply and R2 is not out pursuant to its terms. Abandonment 7.08(a)(2) made an appearance as well, though on face value alone, it only directly applies to a runner at first base after an overrun, as allotted by rule. 7.08(a)(2) Comment: PLAY addresses a runner at third base as well, indicating abandonment may be used at other bases ("Runner believing he is called out on a tag at first or third base starts for the dugout and progresses a reasonable distance still indicating by his actions that he is out, shall be declared out for abandoning the bases") Had this been NCAA College ball, R2 would be out because he was heading for his dugout. This unique phrasing regarding the dugout does not explicitly exist in either NFHS or OBR, though such an interpretation is equally valid (9.01[c]). However, Jim Evans has interpreted it as such, "A player who leaves the infield area abandoning the base paths between 1st base and 3rd base may be declared out once he leaves fair territory. If a play is being made on him, however, he is subject to the guidelines established in 7.08(a.1)...he must be advancing toward a base and cannot go more than three feet out of his direct line to avoid a tag." R2, though, never left fair territory. However, a play was being made on R2 as F6 chased R2 towards first base. Pursuant to Rule 2.00, the defense could have claimed R2's violation of the rules (appeal) for a violation of Rule 7.01, "If a runner legally acquires title to a base, and the pitcher assumes his pitching position, the runner may not return to a previously occupied base." However, after assuming his pitching position, F1 disengaged the rubber and "unassumed" his pitching position. Only while F1 was an infielder (as opposed to a pitcher) did R2 return to a previously occupied base. Right? Well... Rule 7.02 authorizes a runner to both advance and to return to first, second, third and home bases, in order, though 7.02 is subservient to 7.01 and 7.08(a)(1) - assumption and abandonment. 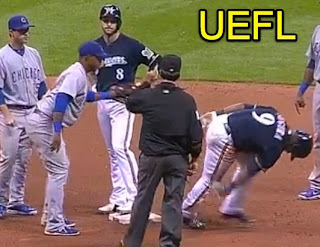 The group noticed Milwaukee first base coach Garth Iorg physically assist R2 to keep him on first base and out of the Brewers' dugout, which is interference pursuant to Rule 7.09(h); however, umpires had clearly ruled "Time" prior to this event. Lastly, R1 is not guilty of passing preceding runner R2 (7.08[h]) as simultaneous occupation is not passing. Some commenters mentioned F6 may have been guilty of obstruction when he stood in front of R2 retreating to second base. If your interpretation is that R2 was obstructed in running the bases by F6's action, this is Rule 7.06(a) "Type A" obstruction as a play was being made on R2 at the time of the obstruction. R2 would be awarded third base while R1 would be permitted to remain at second, immediate dead ball. Notably, Rule 10 (Official Scorer) does not account for such a wild play. Instead, the odd sequence was scored as R1 Braun caught stealing second base and R2 CS third base, as in the case of a pickoff. As addressed by johnnyg08, the Germany Schaefer play from 1911 was a red herring: Schaefer's intent was to confuse the defense and/or make a travesty of the game; Schaefer furthermore returned to a previously occupied base after the pitcher assumed his pitching position. Segura clearly had no such intent. And then... there's Rule 9.01(c), the elastic clause. +1 point to all participants. Segura should have been called out per OBR 7.01 Comment. OBR 7.01 Comment states that, “If a runner legally acquires title to a base, and the pitcher assumes his pitching position, the runner may not return to a previously occupied base.” Since Segura was on second base when the pitcher assumed his position on the rubber, and then was subsequently picked off between second and third, he should not have been allowed to return to first, per 7.01 Comment.